Ipoh — One of the most sought-after locations in Ipoh is now welcoming an exclusive upmarket apartment development that exudes distinction and luxury. Taking shape within what is widely considered to be Perak’s most elite community of Tiger Lane, discerning buyers who appreciate class and quality now have a new prestigious residential address to consider in the form of Upper East @ Tiger Lane. Helmed by Andaman Group, this luxury high-rise project will occupy 7.83 acres of prime land in the vicinity and have a gross development value of RM330 million. Set to be the new landmark of Ipoh’s sterling enclave, the Upper East will feature a total of five blocks of 12 storeys enveloping a beautiful landscape. These will host a total of 529 well-appointed apartment units. According to Andaman Group’s managing director Datuk Sri Dr Vincent Tiew, the company has invested around RM5 million into creating enhanced landscaping and a natural ambience within the project. It has also engaged an experienced Singaporean landscaping firm to helm the endeavour. “We wanted to give residents a resort-like feel and by appointing landscaping firm Site Concepts Int Ltd, this will allow us to deliver top-notch surroundings for residents. The firm has an impressive portfolio which includes Hard Rock Hotel at Bali in Indonesia, Hard Rock Hotel at Pataya in Thailand and many others,” he said. To complement a luxurious image, approximately two acres have been dedicated for the resort-like facilities podium. 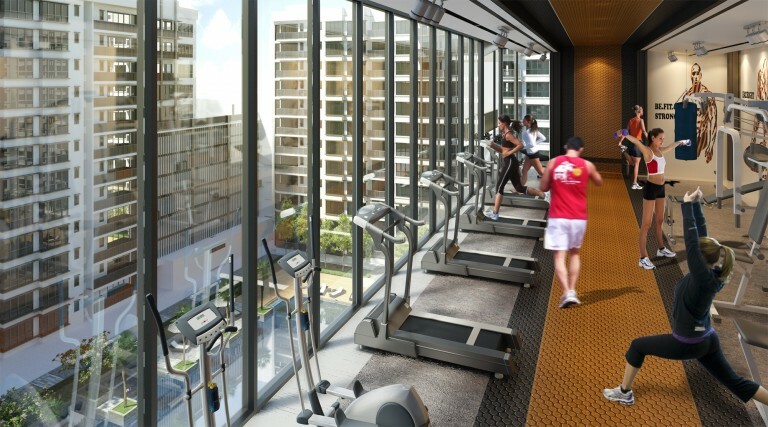 There will be a premium clubhouse for residents alongside a Jacuzzi, an Olympic-length pool, a gym that overlooks the pool, yoga deck, wading pool, sauna, tennis and squash courts, playground and a multipurpose hall, among others. The perfectly manicured and landscaped lawns as well as tropical gardens within the enclave will also have reflexology paths. Upper East offers buyers new standards of exclusivity and privacy. The development features three modern and spacious layouts, which include: Type A with built-ups of 1,162sq ft featuring three bedrooms and two bathrooms; Type B, a dual-key unit measuring 1,507sq ft with four bedrooms, three bathrooms and a studio unit adjoined with one bathroom; while Type C is a 1,787sq ft duplex unit comprising four bedrooms and three bathrooms. According to Tiew, units here are priced between RM400psf to RM600psf. He added that the residences are designed to reflect contemporary charm, complemented by spacious layouts where each unit comes with an 8ft-high corridor walkway and an 8ft door height. Fitted with top quality fixtures and finishing, Upper East is designed to be a perfect reflection of class and distinction. It comes with external façade spray tile and all windows are powder coated. Units will also have plaster decorative ceilings, except for the main entrance, kitchen yard and toilet. Every unit at Upper East will also be accompanied by two car-parking lots located at a dedicated podium. “One of the best things about Upper East @ Tiger Lane is the security of the future tenants, which we have reiterated time and time again is our main priority. A classic and proven three-tier security system will be put in effect at the project,” said Tiew. “Additionally, the project will be equipped with card-activated lifts, 24-hour manned guard house and patrol, direct intercom to security, perimeter security and motion detection CCTV cameras. Visitors’ entry and exit will also be controlled, with the smart addition of visitor profiling,” he added. Overall, Tiew believes Upper East will be a new symbol of architectural prowess in Ipoh, with its magnificent foyer, stunning grand lobby and resort-like atmosphere. This is in line with the expectations of project’s target market, which are high nett-worth individuals, upgrading families, retirees and investors. Set against a backdrop of verdant golf courses and rolling green hills, Upper East will add to the elite locale’s already picture perfect landscape. It is a stone’s throw from popular hotspots, restaurants, business centres and retail hubs and is accessible via Jalan Raja DiHilir and Jalan Kelab Golf, Jalan Sultan Azlan Shah and Jalan Raja Dr Nazrin Shah. The North-South Expressway is also within reach, as is the Sultan Azlan Shah Airport and the Ipoh Train Station (3.36km away). A good selection of reputable schools is also located within convenient distance, such as SMK Sam Tet, SMJK Pooi Nam, Tenby School, Ipoh International School and Tenby Kindergarten. Nearby are also premier healthcare centres such as KPJ Medical Centre, Pantai Medical Centre and the Perak Community Specialist Hospital.